Since we only had a few hours between the game at Dodger Stadium on the 5th and the game in Anaheim on the 6th, this report will be a little shorter than usual. The game we attended in Los Angeles against the Angels the day before was pretty crazy so we were really excited to see another game between those two teams again but this time in Anaheim. We woke up early because we wanted to spend the day at the beach in Venice Beach. We had to fight (again) with L.A. traffic to get from Los Angeles to the Pacific Ocean. Maybe it is because I spent 6 months going east to west on the Metropolitaine in Montreal Monday to Friday in traffic, but we tough it wasn’t as bad as we have been told. Venicce beach is a small town situated south of Santa Monica where there is a big ‘’beach’’ life. Out there, we don’t see the same things us Canadians are used to on the east coast boardwalks. Homeless persons selling homemade objects are next to those ‘’doctor’s office’’ where you can go in and get a prescription for medicinal marijuana in less than 30 minutes! 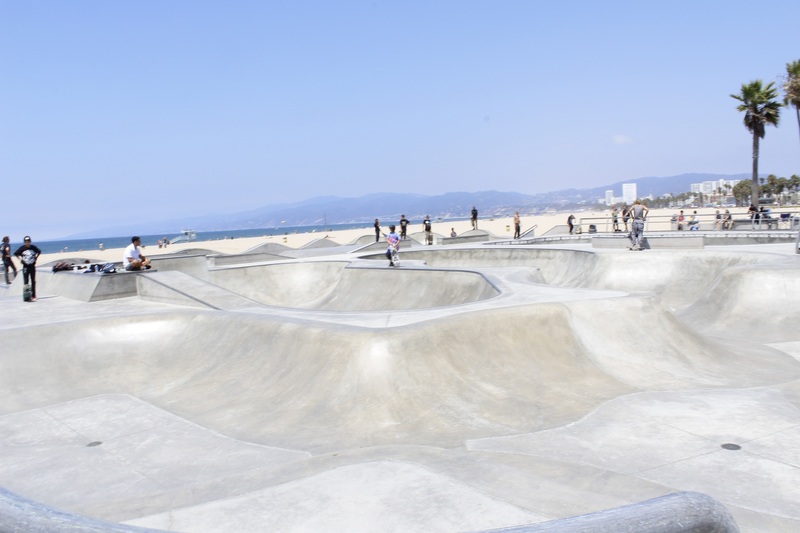 Venice really is a touristic place but it still kept a charm from the hippie years and from the beginning of the skateboard trend (you should watch the movie Lords of Dogtown). It was really nice to relax for a few hours at the beach. We could swim in the big waves of the Pacific Ocean and I was lucky enough to see some dolphins swimming in playing around not too far from the beach. While at the beach, we also love to get our gloves and throw ball so we don’t lose it! 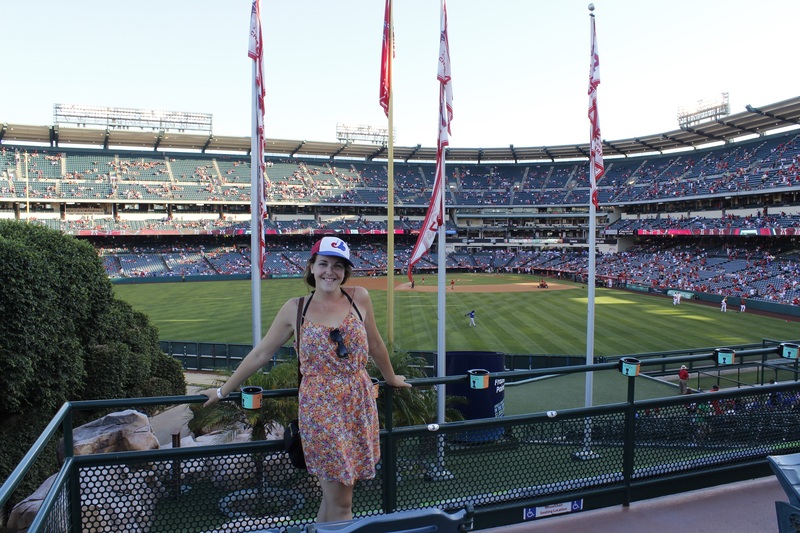 We left the beach and Venice to go to the Angel Stadium of Anaheim in Orange County. We went into rush hour traffic but we made sure we would leave early enough to have plenty of time at the ballpark so we could do our usual visit. The ballpark is located really close to the highway and it’s not surrounded by anything in particular (except for Disneyland). 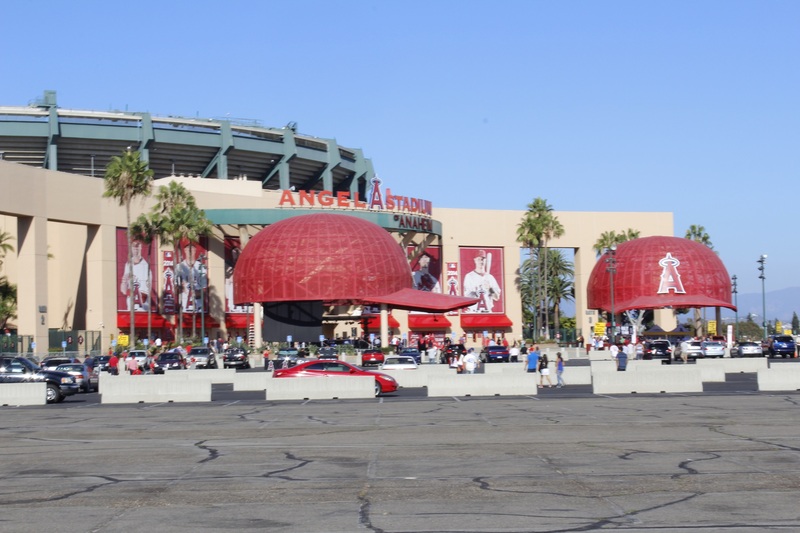 Huge parking lots surround the ballpark to welcome all visitors. 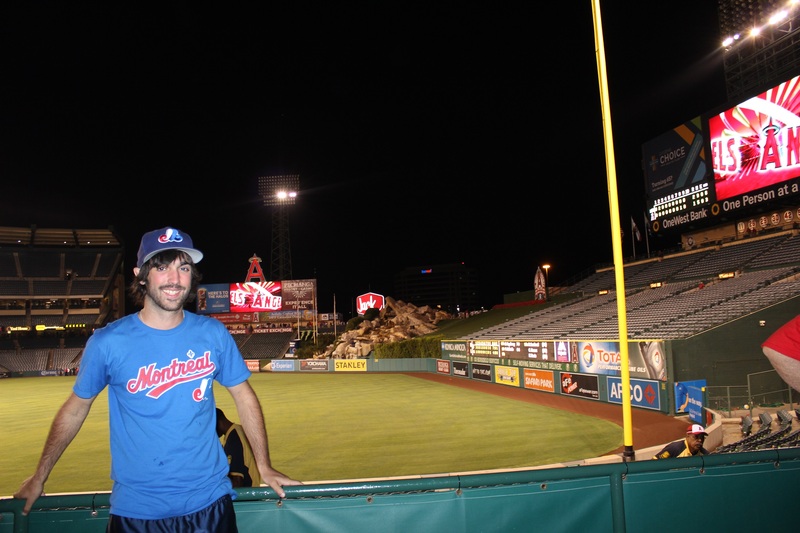 After visiting the 3rd oldest ballpark in the league the day before, we were visiting the 4th that night! Angel Stadium was built in 1966. We were surprised, when we got into the park, to see narrow hallways and a floor reminding us of the Montreal Metro. 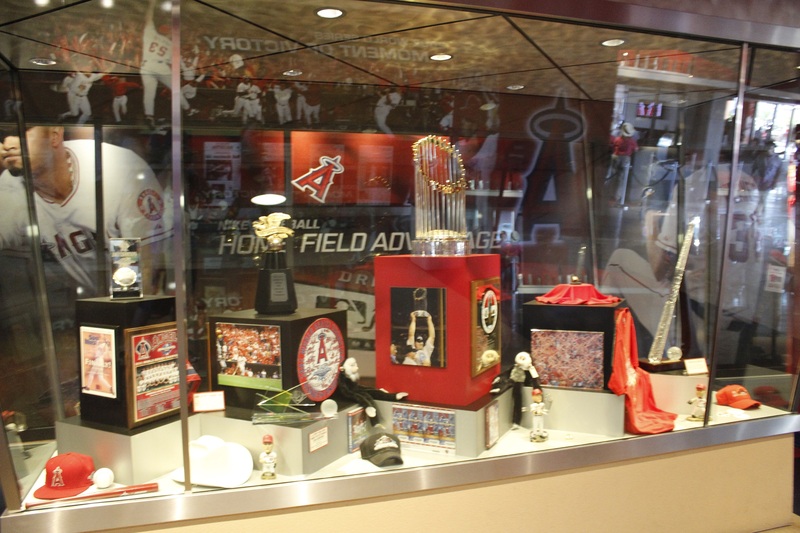 Next to the main entrance, you can admire through a glass case, the World Series trophy. 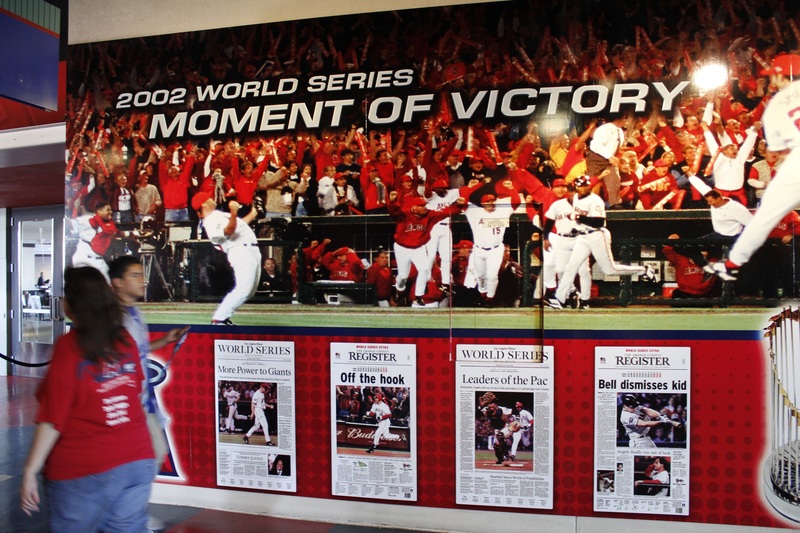 The Angels won it in 2002. They had to wait a really long time to win it. The team was created in 1961. They even had to wait until 1979 to get their first division title and pass for the post season. Another particular situation for the Angels, was that they had to share their park with the, now in St-Louis, Los Angeles Rams from 1980 to 1994. The problem was that the team had, at that time, a seating capacity of 64,000 for the baseball games. It was too much so the team had to reduce that number to 45,000 when the Rams left. Since then, the team is renovating the ballpark bits by bits every year and many are thinking that it would be much cheaper to get a new ballpark. During our visit, we could see that the Angels were offering a large variety of food to the fans. 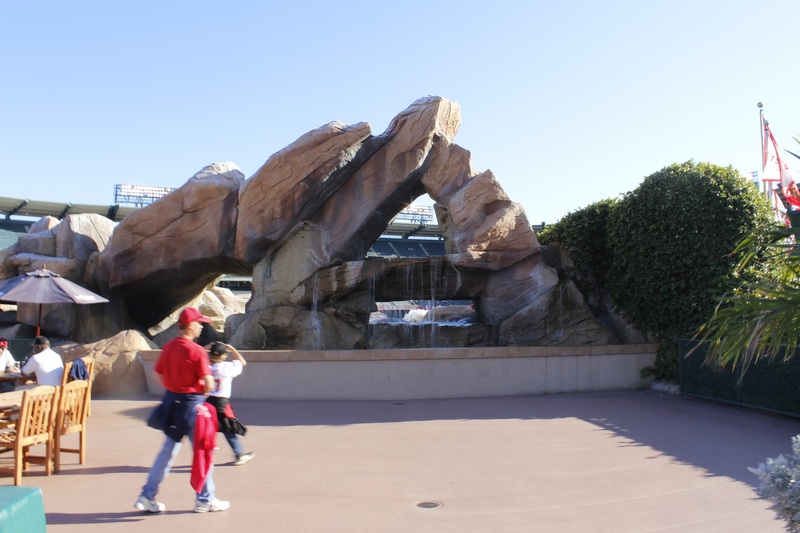 In centerfield, we could see their famous rock formation with the waterfall that reminds us of the Californian desert. This rock also shoots fireworks during the lineup presentation and when the Angels hit a home run or win a game. And that’s about it for the ballpark… We asked employees at the ballpark and they told us that there was not that much to see at the park! Before the game, we met Bill Shaikin: Reporter for the LA times that’s covering baseball for the south of California. We took a few minutes with him to talk about the Angels and the Expos. He told us that baseball in the Great Los Angeles area is really doing well right now: the league could add a third team and fans would fill up the stands. In our last article, we mentioned that the population of the Metropolitan Los Angeles area was 17 million. This is why he told us that, concerning football in LA, the region is doing really well without football and that they have the stronger hand in this dossier. Bill also talked about the return of baseball to Montreal. He was really realistic about it. Montreal people should be aware that the cost of getting a new team is going to be really high.1 billion for a new ballpark and 1 billion to buy a franchise. We should know that we cannot try to cut the price or get a team for a cheap price. Thanks Bill for taking the time to speak with us! During the game, we went down to the post game conference room to discuss Angels with Tim Mead. Tim is Angel’s vice-president and invited us to ask him questions. We firstly asked him why the team changed the name of the team from Anaheim Angels to Los Angeles Angels. He told us that it was simply to reach to a greater fan base. They don’t pretend to be a Los Angeles baseball team. They are an Anaheim team that is targeting the Los Angeles population. 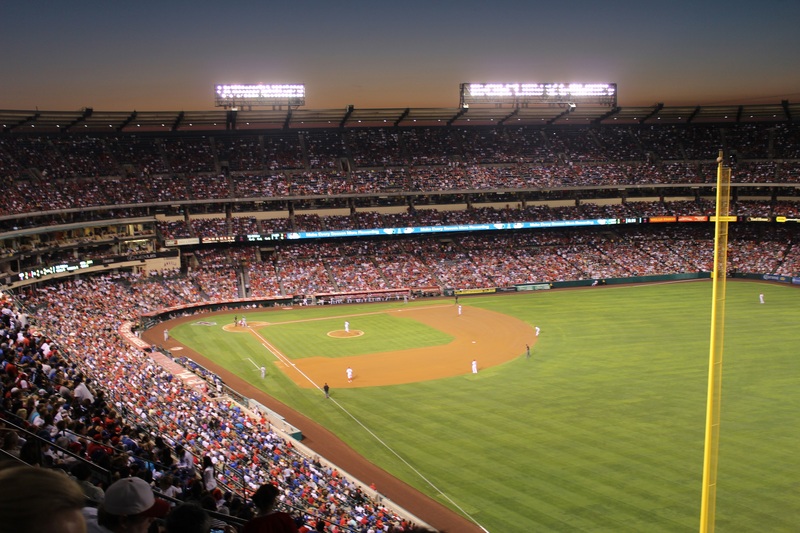 The Angels fans are really faithful to their team: they would get seasons with 20,000 season tickets holders! He told us about that seating capacity change (65,000 to 45,000), which we mentioned before, that really helped the team doing better with attendance. One important quote we could get from him would be: It’s all about winning, especially in Los Angeles. We understand this situation in Montreal. Like we said earlier, the Angels struggled a lot during the first years of their existence. The Division championships of 2004, 2005, 2007, 2008 and 2009 really helped the team to build themselves a good fan base. In 2003, the team got 3 million fans in attendance that year for the first time. Since then, they never went under that number. The team lease in Anaheim will be coming to an end in 2016. We will be following the developments closely. Thanks a lot to Tim for taking the time to answer our questions on such short notice. It is really helpful for us to meet people working for the teams. We were sitting pretty far from the home plate. Hopefully, we had bought our tickets in advance because we looked at the price of similar tickets for that game on the internet and we would have paid 3 times what we did! When we got to our seats, we realized that we were surrounded by a sea of blue. The Dodgers fans were a majority on the upper deck and probably in all the ballpark (video). Like we always do, we were rooting for the home team but this time we felt like we were a minority to do that! 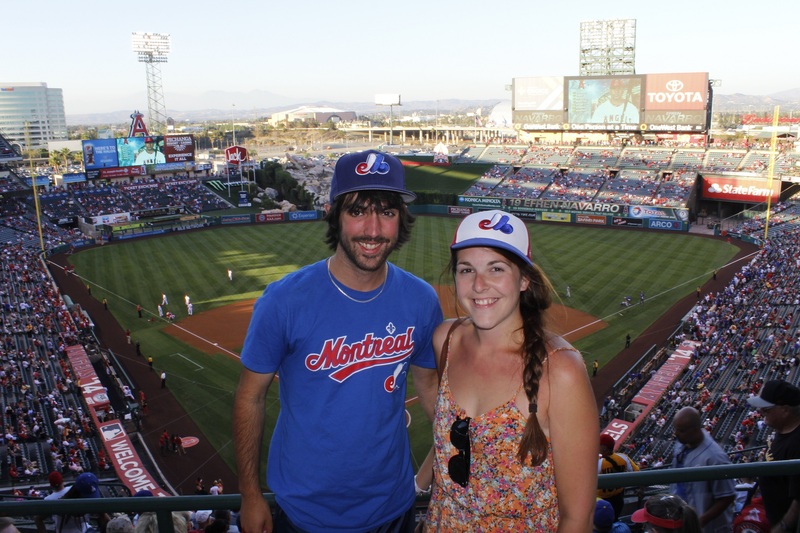 We have to say that the Dodgers fans surrounding us were really nice to us and totally understood why we were rooting for the Angels! Starting pitchers were Dan Harren for the Dodgers and Matt Shoemaker for the Angels. A solo home run by Matt Kemp and a double by Andre Ethier in the second inning put the Dodgers on top 2-0. The story of the game was Dan Harren shutting down the Angels and only according his first hit in the 6th inning. Howell relieved him in the 8th inning but he let the Angels get on the scoreboard on a sacrifice fly in the bottom of the 8th inning. In the 9th, Kole Calhoun would get to second base without any outs. Angels big guys: Mike Trout, Albert Pujols and Josh Hamilton would get all three outs and the win would go to the dodgers: 2-1. We are leaving Angel Stadium of Anaheim with many observations. First of all, the ballpark is a little bit in the middle of nowhere. The experience at the ballpark seems to be more oriented on the game itself. 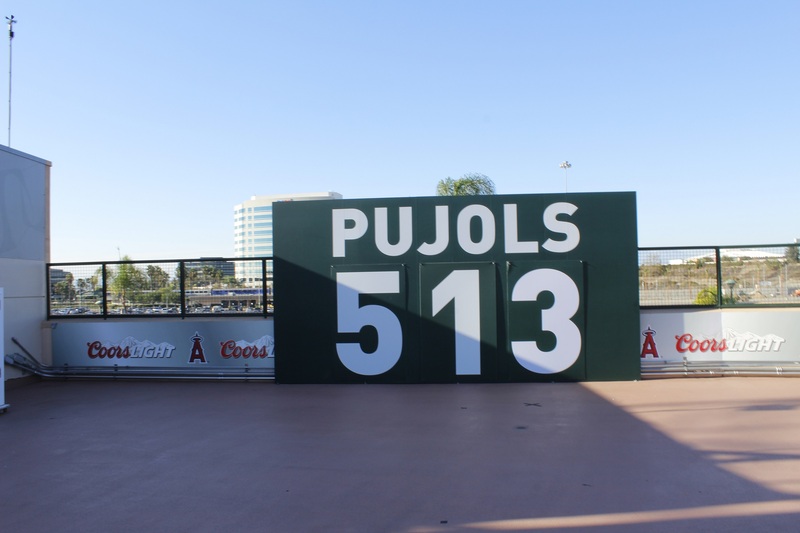 The team is keeping their fans with players like Mike Trout, David Freese and Albert Pujols. The Angels fans are really different than the Dodgers fans. More calm but they love their team. People would say that the Angels fans are from the suburbs and the Dodgers fans are from the city. That is an easy statement due to the location of the Angel Stadium. We really appreciated both fan bases out there. Like Bill and Tim told us, professional sports is doing really well in the Los Angeles area and they could add more teams and it will still be good. We are leaving the Los Angeles area with two totally different experiences. We are heading south for our next stop: San Diego and the Padres. We will spend a few days with my sister and her friends before the Padres are coming back to town. P.S. We have heard many special songs in the ballparks until now. The Angels are playing, in the middle of the 7th; Build me up Buttercup by the Foundations! P.P.S. Did you know that Anaheim means the house of Ana in German?